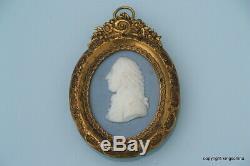 WEDGWOOD JASPERWARE PORTRAIT MEDALLION MINIATURE. 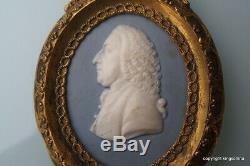 A superb 18th C portrait medallion. 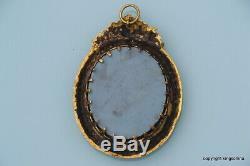 High quality ormolu mounted frame. 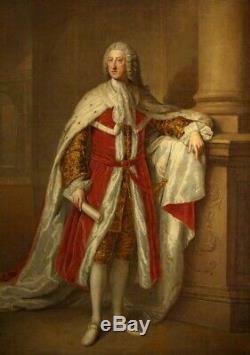 It represents William Pitt the Elder, Prime Minister. And one of Great Britain's finest statesmen. Excellent condition, measures 74mm tall including frame. See The V&A Museum London for 2 similar classical medallions. Wedgwood & Bentley in black basalt ware. WE WELCOME OUR CHINESE CUSTOMERS OLD AND NEW. The item "1790 Wedgwood JASPERWARE Portrait Miniature WILLIAM PITT PRIME MINISTER vase" is in sale since Wednesday, April 3, 2019. This item is in the category "Pottery, Porcelain & Glass\Pottery\Wedgwood". The seller is "kingschina" and is located in Snape, Nr Aldeburgh. This item can be shipped to North, South, or Latin America, all countries in Europe, all countries in continental Asia, Australia.